Anzio was one of the greatest battles of World War II-a desperate gamble to land a large amphibious force behind German lines in Italy in the hope that the war could be shortened by capturing Rome. It also turned out to be one of the bloodiest battles in U.S. military history. 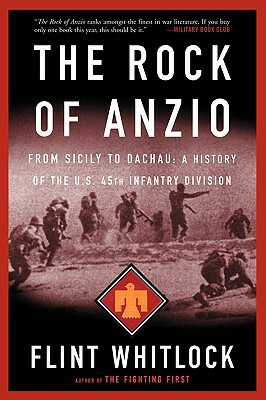 Based on extensive research into archives, photos, letters, diaries, previously classified official records, and scores of personal interviews with surviving veterans of the 45th, The Rock of Anzio is written with an immediacy that puts the reader right onto the battlefield and shows us war through the eyes of ordinary men called upon to perform extraordinary deeds. Pulitzer Prize-nominated author Flint Whitlock is a former U.S. Army officer who served on active duty from 1965 to 1970, including a tour in Vietnam. He has been a military historian since 1986 and is the author of Soldiers on Skis, The Rock of Anzio, and The Fighting First. He is a regular contributor to World War II magazine and WW II History magazine. He is the president of the newly formed Colorado Military History Museum, Inc. He lives in Denver, Colorado.